Kramer Kronos is a key component of the Kramer meeting room ecosystem. We’ve paired a secure cloud-based platform on the back end, with in-room displays and touch screens on the front-end. Projectors powered on, lights dimmed, and shades lowered, it’s all automatic and it’s all thanks to Kramer Kronos and Kramer Control Integration. IT administrators easily author scenarios, room settings and device behavior that you trigger with your room booking. No more wasted time warming up or setting up – just show up and present. Kramer Kronos provides you and your guests with an easy and intuitive way to schedule, book and locate your ideal meeting space. 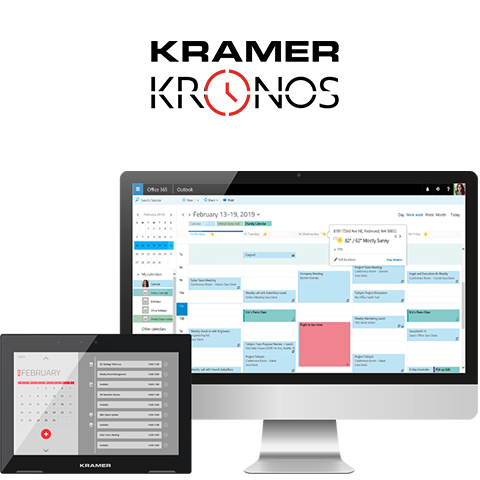 Kramer Kronos works seamlessly with the most popular scheduling platforms like Microsoft® Exchange, Office 365® and G Suite and can be displayed on iOS and Android tablets.